At its core, the foundation of the difference in a Solus wedge lies in their "Crescent Cut" sole contour. The rearward 2/3 of the bounce contour of a conventional Sarazen wedge (Gene Sarazen, the original creator of the sand wedge, back in the day) sole has been repositioned upward and behind the leading edge of the clubhead. From there, the bounce angles are increased slightly and a camber is added to the rear of that sole contour extending from heel to toe. This improvement in the sole contour lowers the leading edge for better setup and play on square-faced shots from tight lies, downhill lies, and even buried bunker shots. Open the club face orientation for an explosion shot from a bunker, and you reveal an even greater bounce surface area for improved sand play. By relieving the heel area of some club head material, Solus wedges feature a "pro-grind" look and feel and allow the golfer to play open-faced lob shots without worrying about bellying the ball with a raised leading edge. The CG (Center-of-Gravity) for the club head is also slightly raised and moved rearward with the design of the crescent cut sole contour. This higher CG is said to increase the ball spin rate and improves the golfers ability to control trajectory. Finally, by moving that CG rearward, Solus claims an enhanced gear-effect and increase in the MOI (Moment-Of-Inertia) of the clubhead for better distance and directional performance on off-center hits. The patented Crescent Cut sole contour is provided on all lofts of the Solus wedges. Current models of the Solus wedge are available exclusively to Pro Tour players. This is due to the fact that earlier production models have what are now non-conforming grooves. 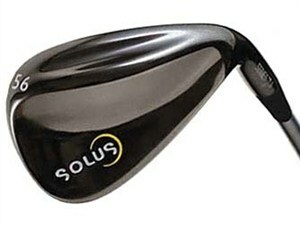 However, Solus wedges can be found online at the usual outlets, be it auction sites or used club vendors. Solus wedges are available in a variety of lofts and are often sold in sets of three (lofts are usually 51, 56 and 61 degrees in the set). Early models were typically produced in stainless steel, while more recent models have been made with a beautiful gunmetal black gloss finish.